Former players often take well-marked off ramps on their retirement journeys. Coach. Broadcaster. That’s what makes Billy Sample’s off-road adventure the stuff movies are made of. 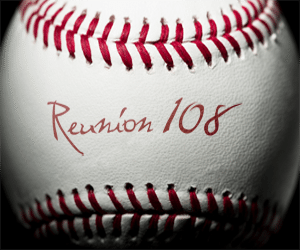 You see, the well-traveled announcer has written a baseball movie called Reunion 108. His credits, “Screenwriter, producer, co-director,” may not fit onto one baseball card. Here’s other hits from our e-conversation. Q: Were you standing in an outfield one game thinking, “Soon as I retire, I’ll write a movie about my baseball experiences”? When did this idea find you? How much time did you spend writing the screenplay? A: My first game in the outfield was at old Arlington Stadium and I was overcome with fear because anything hit to me in left field would travel into the lights. That stadium and old Memorial Stadium in Baltimore were the worse and naturally I would lose a ball in each stadium that would costs the team a ballgame, and I also broke my wrist because of the large, low row of lights (in Arlington). However, you asked about the script-screenplay-movie, and no, though I enjoy writing, I never thought about chronicling my baseball experiences while playing. I had written a ‘book’ about twenty three years ago, and though it was received well by an editor at one of the large publishing companies, when the script was sent upstairs, the conclusion was that I didn’t have enough name recognition. I thought I could make up their investment in my hometown alone, but I didn’t get the chance to present that rebuttal. About the screenplay, I had notes around the house for quite some time, so when it was time to put it together, it didn’t take long. Q: How much time during your playing and announcing career have you spent watching TV and movies? What’s been your opinion of baseball films…seeing that REUNION 108 makes mention of BULL DURHAM in its synopsis? A: Well, the screenplay Reunion 108 is an edgy, satirical, R-rated comedy with parody (a lot like me). It was nominated and took home top honors at the Hoboken Film Festival this past summer in the unproduced screenplay category. Q: How many teammates and foes know about the movie to be? What’s your answer for the former players curious about whether you’ll be basing any of the movie around their own adventures on or off the field? A: My former teammates, who know me at all, know that I’ll take bigger secrets to the grave than anything they’ve done. I used the entire landscape of major and minor league ball as my mosaic, and if the stories aren’t universal, then the specific ones are traceable to no one but me, and I’m not talking (well, aside from the screenplay:-) Word may have filtered out to a couple of former mates, but it would be just a few … I most often thought of my Double-A Tulsa team when honing the logistics and makeup of the script, though very little, if any, involved their exploits. Q: When will the movie be cast? What’s the timeline for production, until us eager fans of yours get a look? A: At the moment, our tentative schedule is to hold a casting session in New York later in February and start shooting in mid March … we will show clips on the website as we move along in the shooting … I conducted a casting session in my hometown of Salem, Virginia in December. The movie will be shot there and in the NYC area. Q: One of the coolest parts of this story is that you’re doing this movie with your son’s involvement. Tell me about him, please! A: My oldest son, Ian, who has spent the last five years in Japan playing football (yeah, right, who knew they played football in Japan?) is working on his third screenplay. He has penned a beautifully creative romantic comedy titled, Wingman, that we’re hoping to package in the near future. Anyway, he helped me immensely in structuring my script into proper screenwriter’s form and is co-producing with me. We have formed a production company, Carms Production, ostensibly to warehouse our scripts. On his way from Chiba to Ireland to meet his mother for the mother-son vacation he had always wanted to share with her, he stopped in Switzerland to research William Tell at museums outside of Zurich for a reference in one of his scripts. No, he is not shooting an apple off my head. If I make any significant money off Reunion 108, I hope to make this my next project. Mrs. Harmon just turned 98, after that, then the Reunion sequel … fingers crossed. Q: How can collectors spread the word or help? A: If anyone wants to own a non-management piece of the movie, I’ll leave that avenue open (thousand dollar minimum). I’m trying to shoehorn an ambitious shooting schedule into a SAG ultra low budget (everything, including cast, crew and post production under two hundred thousand dollars) We are shooting on a red camera or red epic camera, which I had to have after watching more independent films over the past few years than I’d care to admit, and our co-director, cinematographer, James Suttles has grown up capturing the beauty of his home area in western North Carolina, near Asheville, thus, it should have the quality of a major motion picture on an independent film’s budget. Q: Movie or not, people still write for your autograph? I considered signing autographs as part of the entertainment package, but would never admonish a player for not signing, generally people have their reasons, plus I think it’d be a tad boring if we all were alike:-) Oops, an addendum, I hate signing something for free and then see someone selling it on eBay, though I have to keep in mind that often at card shows, in which I’m getting paid, I might have signed extra cards/pictures to a promoter, who may in turn, try to recoup his or her costs by selling them online. Q: Thank you. People read my blog are collecting fans. Yes, they like autographs. However, they’d gasp if you called them DEALERS. Your thoughts? A: I think most are like this, but I recognize some of the ‘dealers’ and occasionally, I’ll let them know that I know they are dealers. A huge standing ovation to Gregg Kersey for suggesting this feature. 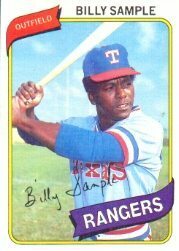 Most of all, I’m grateful to one Billy Sample. I hope we’ll see likenesses of him on the silver screen soon, as well as his witty insights on team broadcasts even sooner. The Mets called dibbies on him. Some team is bound to shine if Sample is mikeside in 2012. Meanwhile, enjoy pre-movie coverage from Sample’s hometown newspaper! Happy 2nd Blog-iversary To Us!